Today (Wednesday, Sept. 12) is the fall-semester deadline for changing passwords on all K-State eIDs. This mandatory password change applies to both individual eIDs and group eIDs. Aug. 1-Sept. 12 is the timeframe for changing K-State eID passwords for the Fall 2012 semester. This mandatory password change occurs each fall and spring, and applies to both individual eIDs and group eIDs. The spring 2012 semester eID password-change period is open until Feb. 8. This mandatory password change occurs every fall and spring and applies to all eIDs, including individual and group eIDs. To change your password go to eid.k-state.edu, sign in with your eID and current password, then click “Change your eID password” and follow the steps. Forgot your password? Call the IT Help Desk (785-532-7722) and verify your identity. Staff can set a temporary password for you to sign in. Email reminders are sent to K-Staters with unchanged passwords prior to the password change deadline. After Feb. 8, those with unchanged passwords will lose access to K-State webmail, iSIS, K-State Online, limited-free printing, university computer labs and other resources. Wednesday, Feb. 9, is the last day for all K-Staters to change the passwords on their K-State eIDs for the spring semester. This mandatory password change occurs each fall and spring, and applies to both individual eIDs and group eIDs. After Feb. 9, unchanged passwords will lose access to K-State e-mail, iSIS, K-State Online, the university computing labs, and other IT services. Remember that K-State will NEVER ask for your password via e-mail. Any e-mail that does so is a scam and should be deleted immediately. 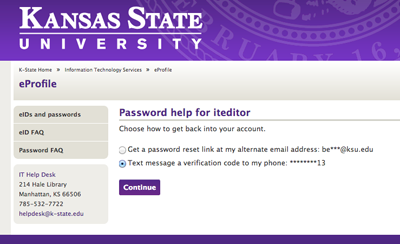 The spring 2011 deadline for changing passwords on K-State eIDs is Wednesday, Feb. 9. This mandatory password change each fall and spring applies to individual eIDs and group eIDs. Be aware that passwords can now be longer — up to 30 characters — and can include blank spaces. All other criteria remain the same. The Password FAQs list the complete password criteria, plus tips on choosing a good password. To change your password, sign in on the eid.k-state.edu website, click “Change your eID password”, and follow the steps. When choosing an eID, the person can pick from several options based on their name or enter their own c ustom eID.